How to create an Amazon S3 Bucket. Amazon S3 Buckets creation. Amazon S3 Buckets in Europe. How to create Amazon S3 Buckets in US, Europe and Asia Pacific Regions. New Amazon S3 Bucket. S3 Browser Freeware allows you to easily create Amazon S3 Buckets in all regions supported by Amazon S3: US East (N. Virginia, Ohio), US-West (Northern California, Oregon), Canada (Central), EU (Ireland, London, Paris, Frankfurt, Stockholm), Asia Pacific (Singapore, Tokyo, Mumbai, Seoul, Sydney), South America (Sao Paulo). 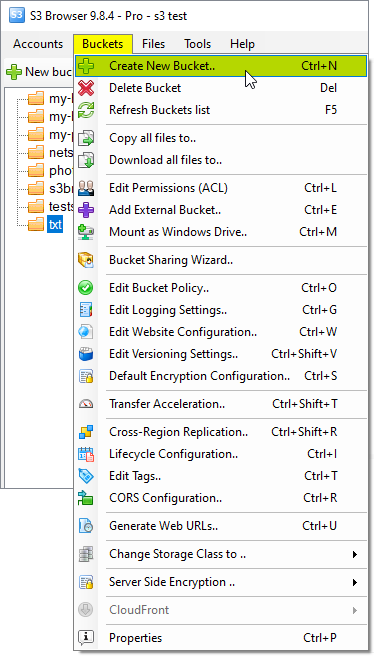 You can also use Ctrl+N keyboard shortcut to create a new Amazon S3 Bucket. 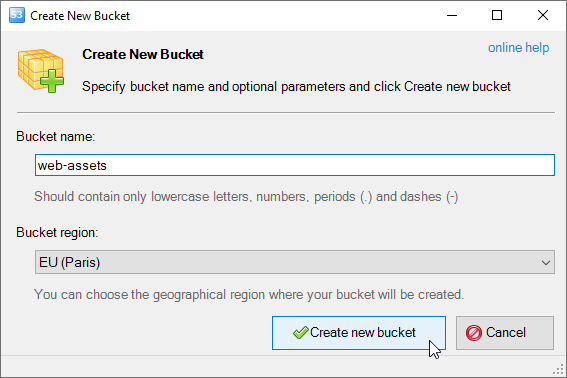 Create New Bucket dialog allows you to enter new bucket name and specify bucket location. US East (N. Virginia) - Uses Amazon S3 servers in US East (N. Virginia). US East (Ohio) - Uses Amazon S3 servers in US East (Ohio). US-West (Northern California) - Uses Amazon S3 servers in Northern California. US-West (Oregon) - Uses Amazon S3 servers in Oregon. Canada (Central) - Uses Amazon S3 servers in Canada. Europe(Ireland) - Uses Amazon S3 servers in Ireland. Europe(London) - Uses Amazon S3 servers in London. Europe(Paris) - Uses Amazon S3 servers in Paris. EU (Frankfurt) - Uses Amazon S3 servers in Frankfurt. EU (Stockholm) - Uses Amazon S3 servers in Stockholm. Asia Pacific (Singapore) - Uses Amazon S3 servers in Singapore. Asia Pacific (Japan) - Uses Amazon S3 servers in Tokyo, Japan. 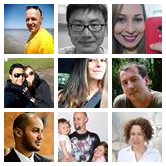 Asia Pacific (Sydney) - Uses Amazon S3 servers in Sydney, Australlia. Asia Pacific (Seoul) - Uses Amazon S3 servers in Seoul, South Korea. Asia Pacific (Mumbai) - Uses Amazon S3 servers in Mumbai, India. South America (Sao Paulo) - Uses Amazon S3 servers in Sao Paulo, Brazil. New Amazon S3 Bucket will be created. Your new bucket will appear in the list. New Bucket 'reports-and-invoices' was successfully created. 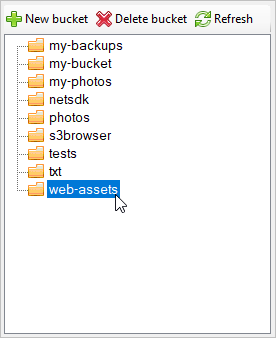 Once you have created a new bucket, you can create the folders to organize your files, and upload and download files to and from Amazon S3.